See what I mean? That so-called “Walkie Talkie” building that’s pretty far away is taller than the Tower that’s in the darn foreground. So, looking at it now, no it’s not much of a tower compared to the other buildings in London. Then I got to talking to a tour guide (the Beefeater guys at the Tower are hilarious! 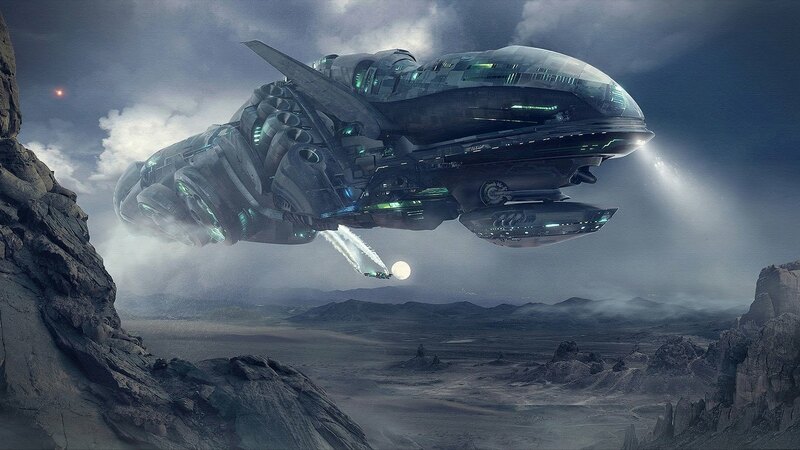 Check them out on youtube) and he explained: it might not seem very tall now, BUT when William the Conqueror built it in the 11th century it was like an alien space ship that had landed. 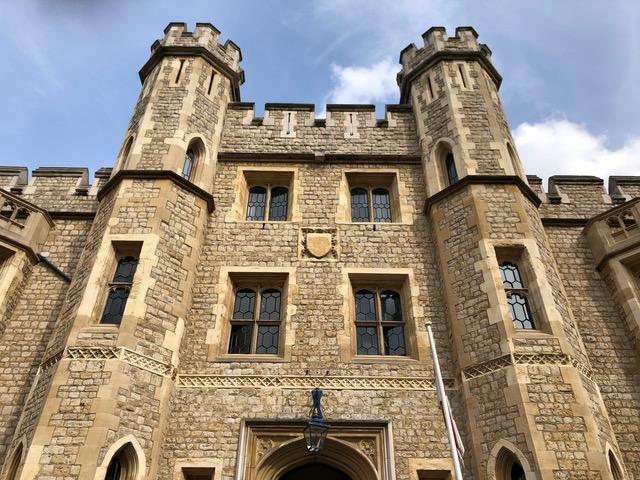 It’s been used as a royal palace, the crown jewels are stored there, there’s an armory, it’s been used as a mint, an observatory. Yadda, yadda, yadda. But did you know it had been used as an impromptu zoo? Ok, so in the 11th century, there was some monarch in Finland — maybe it was Norway — yea it was Norway — ok so this Norweigan king wants to give our King a present. Now what do you give to a guy who’s got everything? (Same problem people have trying to find a gift for Dad at Christmas.) The Norwegian king dude gives our king dude a POLAR BEAR. Yes, a polar bear. Google it if you don’t believe me. See, even Perry is pondering. 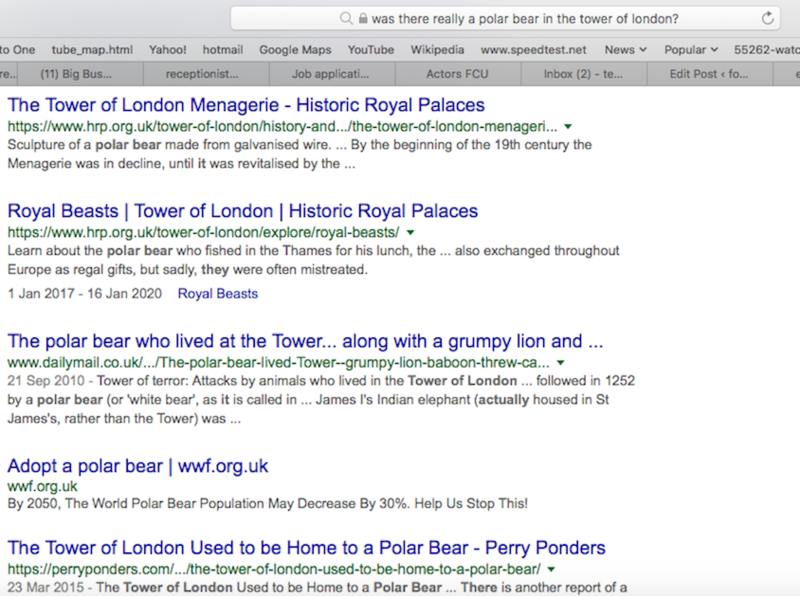 Well, what the hell do you do with a polar bear in London? Yep, you put it in the Tower. But it was so expensive to feed the creature that they started letting him out daily (chained up) to catch his own fish in the Thames. And people miles away would delight in watching it. There are still pubs called the White Bear– that’s where the name comes from. 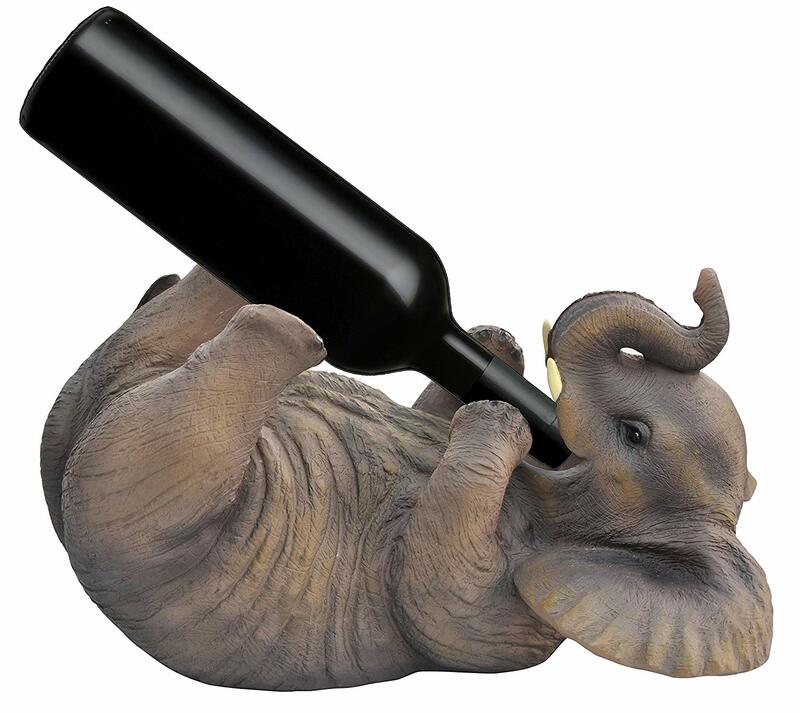 This is “Whimsical Elephant Tabletop Wine Bottle Holder – By Hilarious Home” avail from Amazon for $39.99. Doesn’t ship to the UK. Sorry, peeps. 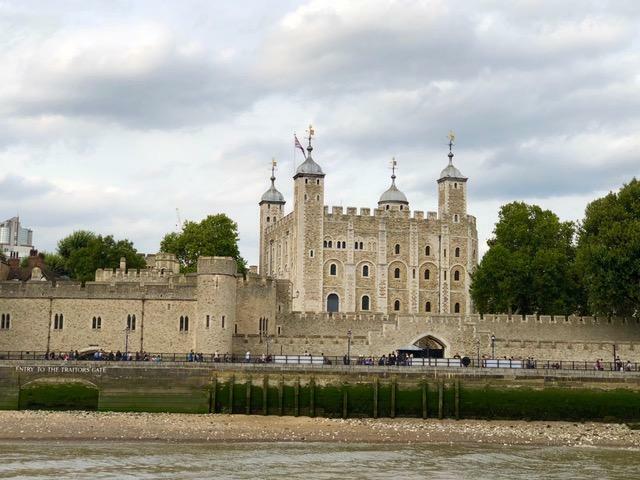 Well, ok, so you can’t talk about the Tower without mentioning the beheadings. There were “only” seven. (If it were my head rolling, even one would be a lot.) British school children learn the following ditty to recall what happened to each of the six wives of Henry the VIII. 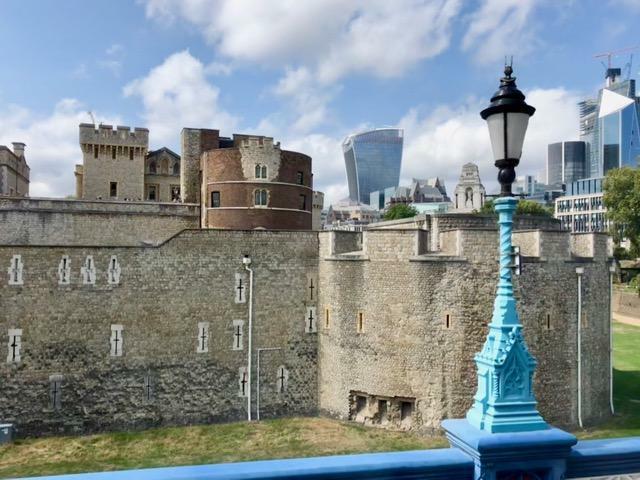 So two of his wives — Anne Boleyn and Catherine Howard — were beheaded at the Tower on trumped up charges of treason or whatever Henry could cook up. So let’s do the math: two wives out of six so… if you married Henry VIII, you had a one in three chance of losing your head over him. Not a bad king, but… terrible husband. PS. 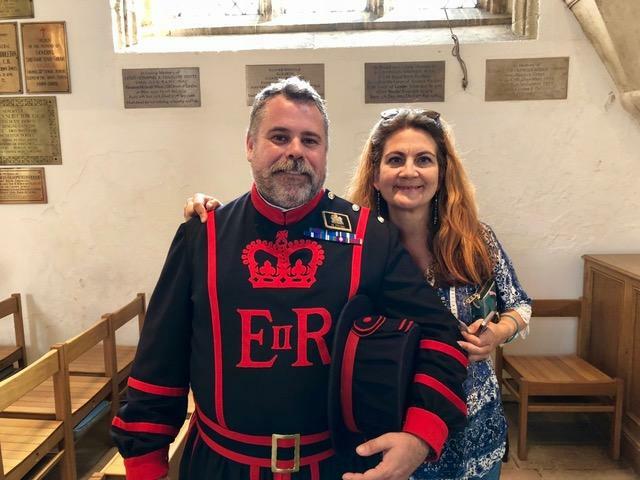 Me and the Beefeater tour guide guy. He wouldn’t accept a tip! This entry was posted in Uncategorized and tagged beefeater, i have no idea what tags are by 4blogssake. Bookmark the permalink.